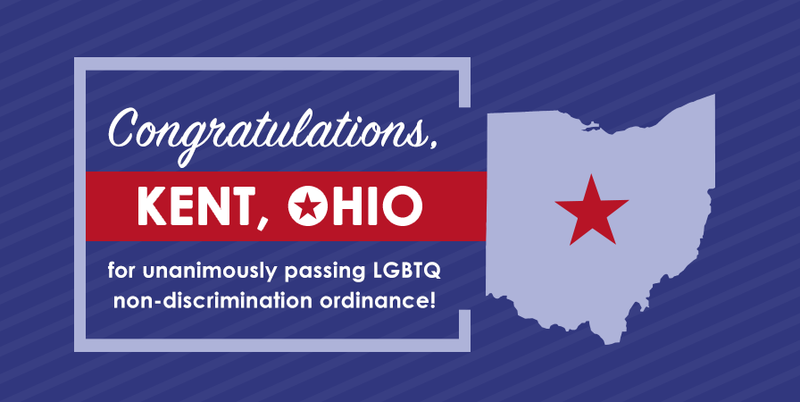 Big congratulations go out to Kent, Ohio – where the City Council on Wednesday unanimously voted to pass an LGBTQ non-discrimination ordinance. By doing so, Kent is the 19th city in the Buckeye State to protect LGBTQ people from discrimination. Kent’s ordinance covers employment, housing, and public accommodations and protects residents from discrimination based on sexual orientation and gender identity. Thank you to Kent Mayor and Council President Jerry Fiala! And thank you to councilmembers Melissa Long, Michael DeLeone, Roger Sidoti, Garret Ferrara, Jack Amrhein, Robin Turner, John Kuhar, Heidi Shaffer and Tracy Wallach! Thank you to Community Development Director Bridget Susel and City Manager Dave Ruller! Finally, thank you to organizers and activists with #Kent4Equality, including Indivisible Cleveland and Portage County Democratic Socialists of America. This wouldn’t have happened without your work. In the past year Ohio has succeeded in passing many LGBTQ non-discrimination ordinances, underlining a serious grassroots movement in the state toward ensuring greater non-discrimination protections for LGBTQ Ohioans. These municipalities are setting a forward-looking example for other cities and towns in Ohio and the rest of the nation. They’re passing these ordinances both because they know protecting people from discrimination is the right thing to do, and they know their local economies will benefit from projecting a more welcoming atmosphere. With each ordinance, activists in the state build momentum toward statewide resolution and signal to federal lawmakers that it’s time for non-discrimination protections nationwide, once and for all.